You will probably spend 1.5 months salary (gross income). According to the 2014 American Express Spending and Savings Tracker survey, unmarried couples cited $2,311 as the average appropriate price tag for an engagement ring. 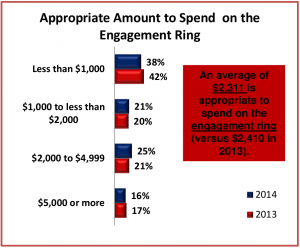 However, surveys suggest that the average cost of an engagement ring is between $4000 and $6000 USD. Thus, couples regularly spend more than they expect. Based on 2014 US Census data, the median income for a single male aged 25-44 who works full time is $38,753. If we assume the average engagement ring costs $5000, then the average single male spends 12.9% of his gross annual income on an engagement ring. Multiplying this percentage by 12 months yields 1.5 months salary, just below the artificial 2 months salary rule created by De Beers marketers. Of course, how much you should spend is completely determined by your personal financial situation. You should not go into debt to buy a ring.